I Won a Tutti Frutti Froyo Treat! Finally, my unlucky streak was broken! 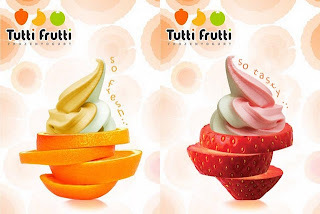 Yesterday morning, Michelle of My Mom-Friday commented on one of my blog posts and told me I was one of the winners of her Tutti Frutti (Centris Walk) Froyo Treats. I needed to write down my answer in her comment box and register my name and e-mail in the form provided to verify my identity. Then, to increase my chances of winning, I also subscribed to her blog, followed her on Google Friend Connect and Twitter, and liked My Mom-Friday page on Facebook. I won one (1) medium cup of my choice of frozen yogurt from Tutti Frutti Centris Walk. Michelle said that the medium cup of Tutti Frutti froyo can actually serve two people! Isn’t that great? I just hope I have time to claim my prize before September 30. I’ve joined quite a few online contests already since I started blogging, but I’ve never won anything because, well, I’m just not lucky! This has enforced my belief that I’m not cut out to be an online contest winner, until Michelle’s notice came. Thank you, Michelle, for breaking my unlucky streak! You’re heaven-sent! I think I should join more online contests from now on. This entry was posted in Centris Walk, Froyo, Frozen Yogurt, Tutti Frutti. Bookmark the permalink. 3 Responses to I Won a Tutti Frutti Froyo Treat! Congrats again Tetcha!!! Enjoy your Fro-yo! I was happy to see your name pop up on top 2! Yesterday was my lucky day too, as I announced winners for Tutti Frutti, I also got emails from other blogs that I WON, first time also for me, and 2 wins at that! what a lucky break, LOL! oh yes, check more update for online giveaway contest. I just won too in one contest two days ago. you're lucky! congrats!!! Wow, what a treat! Congrats in winning Tetcha!